one of our friends from virginia posted this pic recently. i added the arrows. i’m pretty sure the green arrow is pointing to the head that is trying to emerge from inside. i can tell it’s the head because of the frown and the eye. that little tomato man must be really broad shouldered because i think the white arrow is pointing to one of his biceps. I tried to figure it out this morning before work, and I couldn’t get it. Now I see it. Looks like Popeye. 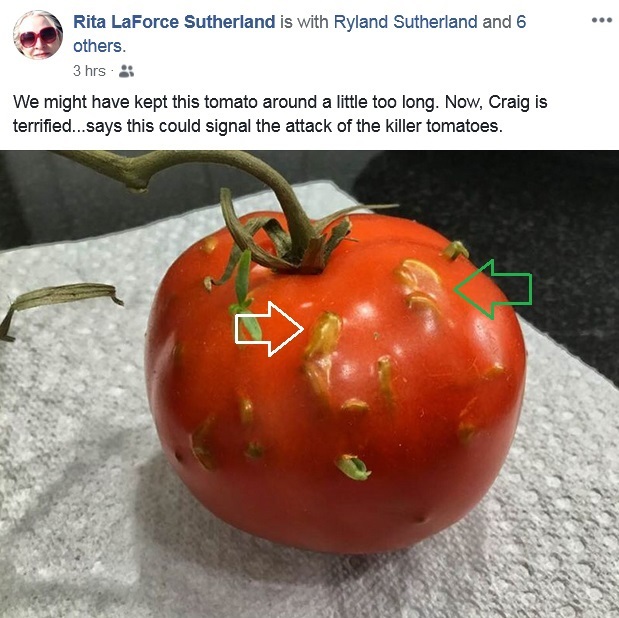 I would throw a tomato away before it got that bad. got to have a bigger imagination than mine. ??? This is not the end of the story. Hang on a day or two to see what happens when whatever thing is in that tomato fully reveals itself. I’ll keep you posted. He’s striking an ‘ahhnold’ pose with his right arm ’cause his left hasn’t formed yet.